Aria is made from a fuzzy multicoloured neon material with black markings that are made to look like feathers. She has large sparkly blue and black eyes and her beak and feet are made from a glittery blue material. Because my colors are bold and bright! Aria was released in September 2015. Her birthday is on 15th November. This is the large 16″ version of Aria. 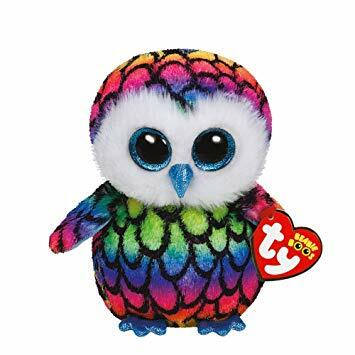 She was also released as a regular 6″ Beanie Boo, as a larger 9″ Beanie Boo Buddy and as a key clip.